Stories generally have a beginning, a middle, and an end. Even stories in series. If they don't have those elements, they are either not terribly well written or they are something else, no matter what they are called. Perhaps a vignette, or a chapter of a larger work. 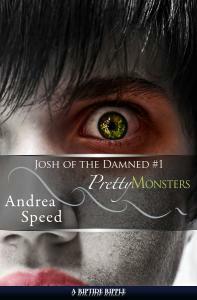 Pretty Monsters from Andrea Speed is a beautifully written something else. There is little to the story that doesn't appear in the blurb, and frankly, quite a bit of promise of plot that appears in the blurb and not the story. The set-up is quirky and witty, a convenience store near a hell portal, where weird beings amble in and out, paying for chips and burritos, and occasionally oozing on the counter. Hot Guy, aka Colin, finally wanders in after one third of actual text pages go by (there are 6 pages of narrative in this 15 page file). The story establishes that Colin and Josh are interested in one another, and that Colin is a really hot weird being. That's it. This is not a plot. So what we have here is a set-up and a hook. The story has #1 attached and the publisher's site bills it as the first in a series, but this reads like the first chapter of a serialized novel. Fine, if I know that's what I'm getting into, but that's not what I've been offered here. This introduction is interesting enough that I'd read more; another installment or two should clarify whether these are meant to be stories or merely chapters doled out at intervals.